October 2007 – Remembering games and daisy chains and laughs. Got some cool maternity wearable stuff yesterday, available at CrossRoads [Forum] and invested in some liberty ‘gift’ vouchers for moms-to-be! Apart from all the attention, looks and other such ‘celebrity’ stuff that comes with it, a mini cooper is just the car that one needs to buy living in a city like Karachi considering the few and precious parking spaces which the city has to offer! ;) I do wonder if I’ll be lucky enuff to get a pick-up from I.I.Chundrigar Road? 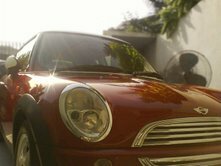 :) Or even if my own first car should be a mini? How funky will that be uh? Tata Mobilink. Our relationship was nice while it lasted and I’ll remember the good times! Hello Ufone. Here’s to you… cheers!